I went to a workshop on a Sunday, and during the lunch break the hostess put out quite a spread. There was a bunch of delicious food, but there was a quinoa salad that really stood out for me. It had toasted almonds, cucumber, and fresh dill. Dill is one of my favourite herbs. I always eat a ton of dill pickles, but also dill pickle pretzels, popcorn, and I used to eat dill pickle chips (but I gave them up over a year ago). This salad was super special to me because it had so much fresh, delicious dill. Quinoa is really a super grain. It’s gluten free, and and it’s an ancient grain. It’s also a complete protein, which means that it has all the essential amino acids necessary for life, and it’s very filling. I ended up finding the recipe online and I decided to make it for dinner! Preheat the oven to 350F. Place almonds on a pan and toast for 5-7 minutes, until lightly brown and fragrant. In a pot, toast quinoa on medium heat for 3-5 minutes until fragrant. Shake it side to side to make sure all the quinoa is toasted. Add the broth to the quinoa and bring to a boil. Once boiling, reduce to a simmer and cover. Cook for 10 minutes, or until broth is absorbed. While quinoa cooks, mix together the olive oil, vinegar, and salt. Set aside. Allow quinoa to cool. Then add the chickpeas, oil mixture, cucumber, dill, and green onions. This salad is super tasty and filling! The original recipe doesn’t call for chickpeas, but since I knew this was going to be my main dinner I decided to up the protein with chickpeas. Plus the chickpeas give it a nice texture, and they seem to work quite well together. It’s a little bit of work to toast the almonds and quinoa, but totally worth it. This can be refrigerated up to 4 days! 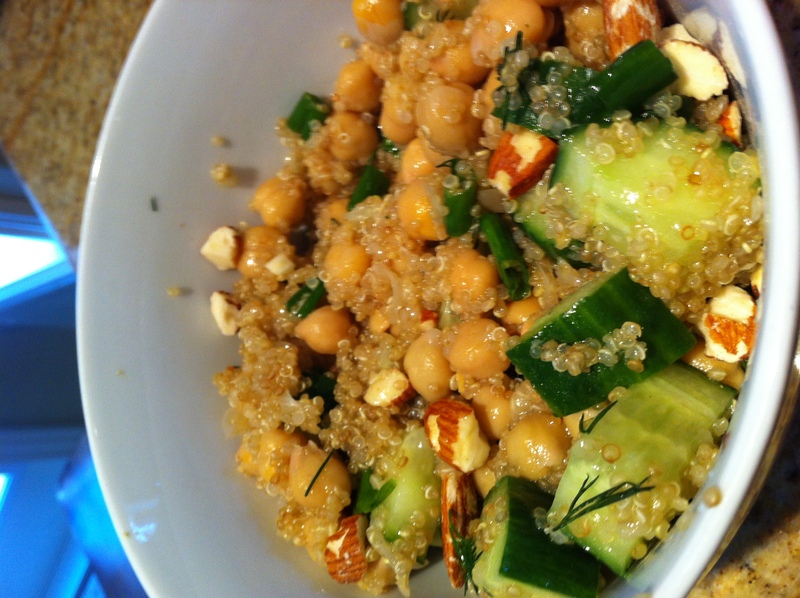 With time I imagine the green onion and dill flavour will be absorbed by the quinoa making it even more tasty. This would be a great salad to bring to someone’s house for dinner, and would be great for a picnic/outdoor lunch since it’s supposed to be served at room temperature.